Ingenious stainless steel water blades include internal baffles to create a fascinating, dynamic sheet of water in pond and water features. 300mm -1500mm. Stainless Steel Water Blades optimise the flow and spread of incoming water through several internal baffles plates, producing clean sheets of cascading water. 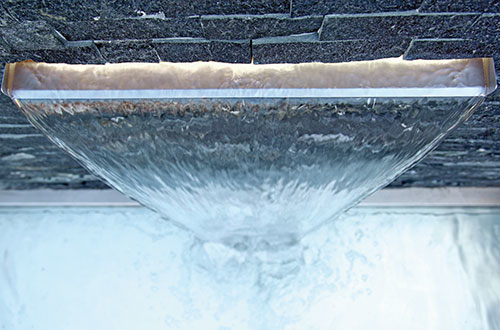 Water blades lend themselves to many different types of installation, these can be used indoors or outside, built into brick walls, mounted to sleepers or mounted externally on the face of a wall to create a dynamic, audible water feature cascade. 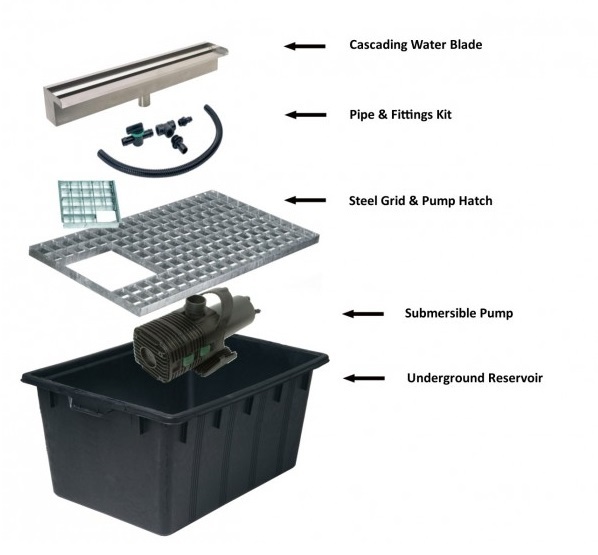 As well as the water blades, we also supply all of the necessary components to create a cascading water blade feature including submersible water feature pump, pipe, connection fittings and wall mounting brackets. Simply click through your selected water blade size to view the water blade and all suitable accessories.